The next ISLN meeting is Monday, April 23rd, at the new Canadian International School -- Lakeside campus. 4:00 for 4:30 start -- and it will be our Annual General Meeting. There is a pre-meeting PD opportunity starting at 1:30pm on the same day. Jenna Emerson is going to run a Follett workshop focusing on eBooks in our catalogs (how to order, import, and circulate, etc.) -- as well as whatever other new stuff re Destiny or Titlewave she wants to show us. This will obviously be of interest to people with Destiny, but others (e.g., Oliver users) may want to attend as well -- as they also can buy/use Follett eBooks. Please RSVP to Lisa Patton (lpatton@cis.edu.sg) if you are interested. UWC and CIS staff are already committed to attending. We still intend to have PD time in network meetings, but we thought pre-meeting afternoons might offer us other opportunities. So this is a trial of sorts. The voting results for individual schools were tallied in a Google Doc and the link was sent to those librarians involved. If you didn't get an email from me and you had students who voted, drop me a line (kda@uwcsea.edu.sg). The Readers Cup competition will be held on May 10, 2012, at UWCSEA East (Tampines campus). Titles (a subset of the shortlists for Younger, Older, and Mature readers) for the Readers Cup event will be announced within the next few days (as we know you're all anxious to start working). What about next year's Red Dot shortlists? 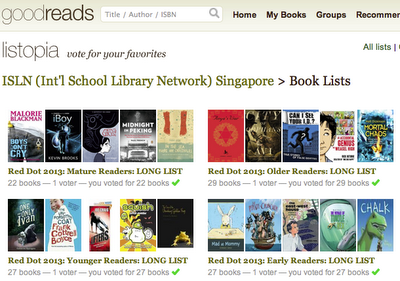 Well, we've already set up Goodreads Listopia lists to collect suggestions. And our goal is to collect and consider these long lists by June -- and announce the shortlists BEFORE the June/July break. So you can be reading over the summer. NB: To put a book on the suggestion list, you do have to have a Goodreads account. Click below to access each of the lists -- and add whatever books you want. I've populated the lists -- to start with -- with books from the Panda Book Awards (the China equivalent of the Red Dot awards) and the Sakura Medal (the Japanese equivalent). Books should have been published in English in 2009, 2010, 2011, or 2012. Anyone interested in being on the Red Dot subcommittee -- i.e., the people who will look at the longlists and pick 8 per category, looking for a balance of type, national bias/source, etc. -- just drop me a line (kda@uwcsea.edu.sg). There will be an open meeting to organize the planning of the next Hands on Literacy conference, scheduled for Saturday, November 17, 2012, hosted at the new UWC East campus in Tampines. Anyone at your schools is welcome to join us -- whether librarian or literacy coach or reading fanatic. Come to the planning meeting: Monday, March 19th -- 5:30 -- at the Prologue bookshop on the 4th level of Ion on Orchard Road. RSVP to Katie (kda@uwcsea.edusg/8233-2922) if you are coming to that meeting OR if you are interested in being on a subcommittee (Venue & Catering, Publicity, Sponsorship & Trade Show, Digital Work (website, app, etc. ), Programme (guest speakers & workshops) & Registration, Budget & Finance, etc.). Some of you may be on spring break that week, but just let me know and I'll put you on the Google Doc of the minutes. As this will be our third conference, we are going into it a bit calmer than the first two -- but, of course, there can always be improvements and changes. Probably the biggest difference about this conference will be that it is preceded (on the Sunday to Thursday) by a major conference in Doha specifically about international school libraries -- the IASL conference, "The Shifting Sands of School Librarianship". Click here to see their conference website. The Qatar International School Librarians are pleased to be hosting the 2012 International Association of School Librarianship conference in Doha, November 12-15 (preconference on November 11). We have some great speakers lined up, including Stephen Krashen (whose latest - yet unpublished - research is all about the value of libraries), Jack Gantos, Joyce Valenza, Laurie Halse Anderson, Naomi Shihab Nye, and Eppo van Nispen. You have until April 1st to propose a research paper for the peer-reviewed International Research Forum and until April 15 to propose a workshop or other presentation. For the online proposal form and other information, go tohttp://iasl2012.org. The registration fee is reduced for those chosen to present. Qatar is the place to be (look for the recent 60 Minutes and CNN reports on Qatar), and November is a great time to be here. It's going to be a great conference! There doesn't seem to be any financial information up on the website yet. So we don't know what it will cost to attend -- or what discount you get if you do a workshop. NB: We are trying to finalize arrangements with Joyce Valenza, teacher-librarian extraordinaire, to have her fly from the Doha conference straight to Singapore to be our keynote speaker on Saturday the 17th. The trick is she needs to be back at work on the East coast of the USA by Monday. The time zones are in our favor, but it will mean she will have to leave Singapore late on Saturday. We'll keep you posted. A lot of us here are interested in attending Doha -- and I don't see any reason why we couldn't get ourselves so organized that we could all go to Doha and still be ready for our own conference on the Saturday. As IASL is such librarian-specific professional development, it would be a shame to miss it just to put on our more generic literacies day of learning. So that's the goal -- go to IASL in Doha and put on a great one-day conference on the Saturday, along with Joyce Valenza. Even if you don't come to the Monday meeting or don't volunteer to be on a subcommittee, you can still give us your ideas. How could we make it better? Have you seen something at a conference that you think we could adopt for our own? Click here to see the website of the last one in 2010 - www.handsonlit.com. Once we start populating a new website, I'll switch over the domain name, but for now it's useful to see what we did before. Feedback can be via the comments here or direct emails to librarynetwork@gmail.com or personal comments to any of the executive committee. Go to the Red Dot website for voting information -- the voting form has been embedded on the front page of the website. In order to know which votes come from which schools (so you can announce your school's winner, which may differ from the country one), we issue each school/library with a School Voting Code. Your students will need to type it in when accessing the online SurveyMonkey poll. You don't have to use the online voting poll. You can collect votes in any way you want -- and them submit the totals to us. There's a form for librarians to submit block vote tallies on the same Voting page on the website. Note: you will find your Block Voting School Code in the same spreadsheet link above. NOTE: for your school's votes to count in the final tally, we need to receive your data by Thursday night (the day after voting closes). For example, you may use the online individual voting form for older students (which involves no extra work on your part, except for passing out the School Voting Code), while opting to tally the picture book votes for your younger students yourself and then submitting those votes as a block to us (see procedure/links on the website). Note: If you make a mistake, just submit again -- all the entries are time-stamped and if we see two from the same school/person, we'll assume the second one is correct.